Head to the Lake District to climb England's highest peak and traverse the picture-postcard Catbells for incredible vistas over Derwent Water. We take care of all the logistics so all you have to do is show up and enjoy a weekend of hiking. You will make your ascent of Scafell Pike from the scenic Borrowdale Valley, and using a different route down makes for a continuously interesting circular walk. On the second day you have an easier hike along the breathtaking ridge of Catbells. Prices are per person based on twin share and include all accommodation in ensuite rooms, 2 breakfasts, 2 packed lunches, transfers to and from the start of the climb of Scafell Pike, plus a comprehensive information pack including maps, route guide, and our emergency contact. Single rooms are available. We only apply a supplement for single accommodation when there is a direct cost to us and we cap this in line with our ‘Fair pricing’ policy. This trip is not suitable for solo walkers. Depending on your time of arrival, there are a number of interesting circuit walks you can take from Keswick ranging from from 1 to 4 miles. Visiting the viewpoint of Castle Head or an ancient Stone Circle below Blencathra, or walking along the rocky heights of Walla Crag, are all possible if you arrive with an afternoon to spare. Close to your accommodation is Hope Park with its pitch and putt and crazy golf courses, bird hide and gardens. A walk through the park brings you to the lake shore where the Keswick launch departs for cruises on the lake. Keswick has many pubs and restaurants and a nightclub. It also has a theatre, a cinema and even a pencil museum! Your private transport will collect you from your accommodation and take you to the start of your climb. The trail starts out level and easy as you follow the river to the picturesque stone arched Stockley Beck Bridge. From here the climb begins in earnest and the retrospective views become more breathtaking with every step. Reaching Esk Hause, an ancient pass used by traders before the advent of roads, new vistas open up and you make your way along the spine of the Scafell range to a final climb to the rocky top of England's highest peak. The 360 views are incredible and this is a great place to enjoy your delicious packed lunch. Descent is by a completely fifferst route, following a good trail past a high mountain tarn and beside a tumbling cascade to return to the Borrowdale Valley. The day's walk ends at appropriately at the Scafell Inn where you will have time for a celebratory drink before your transfer arrives to take you back to Keswick. Take the Keswick Launch across Derwent Water and begin the climb of Catbells. 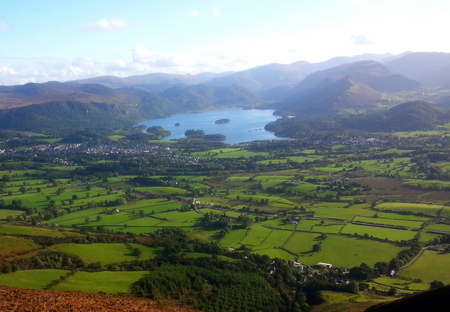 Smaller and less demanding than Scafell Pike, Catbells still delivers on big views. The climb itself is along a fine ridge with the lake on one side and the deep vale of Newlands on the other. You can come down by a different path and enjoy a lovely walk back along the lake shore before heading home after your weekend adventure. A Wandering Aengus information pack containing all necessary maps and route cards, 'info cards' with local information - including locations and opening times of restaurants, cafes, ATMs, supermarkets etc. As keen walkers ourselves we appreciate the importance of the place you put your feet up and rest your head in at the end of your day's walk. Your accommodation for this holiday is a comfortable hotel or guest house in the heart of Keswick. All our accommodation has en-suite bathrooms for twin or double share. Single occupancy of rooms is also available for a supplementary cost. Breakfasts and a packed lunch are provided by your accommodation. For your evening meal, Keswick has many excellent restaurants and pubs and our extensive notes will help you choose the best place to suit your taste and budget. The nearest railway station is at Penrith on the main North-West rail link between London and Glasgow. From Penrith there are taxis and a regular bus service to Keswick - a journey of 16 miles. We can arrange a pre-paid taxi to meet you at Penrith Station. We will provide transfers to the start of the walk on the day you climb Scafell Pike. At the end of this day we will arrange to pick you up from the 'Walkers' Bar' of the nearby Scafell Hotel, so you can enjoy a clebratory drink. If you prefer to drive to the start, we will provide you with details of how to get there from your Keswick accommodation and where to park. Here are some 3rd party websites with useful information to help plan your holiday to the Lake District. The Lake District National Park website is a mine of information and here you can also download a range of maps and leaflets to local attractions. 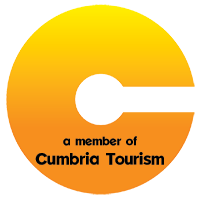 'Go Lakes' is the official website for Cumbria Tourism and provides up-to-the-minute information on events as well as insight guides to the different areas that make up the Lake District. The Mountain Weather Information Service (MWIS) provides weather analysis and forecasts specifically aimed at mountaineers and walkers. Download 3 day forecasts for specific regions including the Lake District. Mike Brockhurst's Walking Englishman website is a free walking resource which provides information on numerous walking routes. Here you can find a list of Englands's highest peaks. Use thetrainline.com to find cheap fares to the Lake District rail access towns of Windermere and Penrith. The charming and lively town of Keswick is known as the ‘Outdoor Capital of England’ and is the perfect base for a long weekend* or weekday break of fell walking. The town is within easy reach of Penrith on the main West Coast rail link between London and Glasgow. Our comprehensive ‘Information Pack’ will comprise of all the maps you need together with our own laminated route notes for guidance* detailing all walking options. We will provide Information Sheets showing the location of your accommodation along with details of local facilities and dining options within the local area to help you prepare for your holiday before you leave home. *A weekend stay must include a Friday and Saturday night.